In a Nutshell: Technology is rapidly evolving, particularly in the financial services sector, where there are increasingly automated services and greater customer expectations for speed and convenience. Cisco Systems seeks to help companies stay ahead of the technology curve with programs like its Application Centric Infrastructure (ACI). Cisco ACI is a data center solution that employs AI and machine learning to provide thorough, quick, and secure services to its clients, so they can pass along great service to their customers. Since I first opened a checking account 20 years ago, my banking experience has changed drastically — mostly for the better. I am able to spend less time devoted to basic functions including depositing checks, and my balance is always available at my fingertips via my smartphone app. Big banks and credit unions have worked hard to adopt technology that has helped operations run more efficiently and provide a better customer experience. But with technology evolving so rapidly in the space, the institutions must continue to be nimble to remain competitive. Cisco — with its Application Centric Infrastructure networking solution — is one of the key companies helping to bring the financial services industry into the modern era. Financial institutions can stay competitive in an increasingly technology-driven field with considerations like artificial intelligence (AI) and machine learning, cloud-based technologies, and customer experience at the forefront of Cisco’s product. Regardless of an institution’s size, customers have come to expect the same level of speed and automated services they experience in other areas of their lives. Tasks like one-click online shopping, instant access to any song, and getting directions to anywhere in the world are a breeze on smartphones these days. So consumers expect that managing bank accounts, transferring money, and even making investments should be equally convenient. We recently explored these challenges and discussed some of Cisco’s solutions with Dhritiman Dasgupta, Vice President of Product Marketing for Cisco Data Center Solutions, and Al Slamecka, Cisco’s Business Development Manager for Financial Services. Dasgupta said his team comes at everything from an infrastructure perspective, with networking, storage, security, analytics functioning as the main components for a complete datacenter solution. Dhritiman Dasgupta (left) is the Vice President of Product Marketing for Cisco Data Center solutions, and Al Slamecka (right) is Cisco’s Business Development Manager for Financial Services. Within the infrastructure framework, artificial intelligence and machine learning are emerging as the essential components for companies to remain competitive today. Dasgupta said companies are aware that AI is the key to future success even if they are still not sure how it will apply to their specific use. “Right now, we’re seeing four to five customers a week saying that they want to bring in AI to their environment,” he said. Slamecka compared the trend to the adoption of cloud technology that first occurred about seven years ago. He said companies would seek out cloud services before they were sure of their applications. But today they are coming to Cisco with specific cloud application requests, including developing applications faster and machine learning. Dasgupta said that, as with cloud technology, AI is being employed in a vast number of ways, from security applications to cost reduction to improving the customer experience. Customer experience is a huge consideration, Dasgupta said, and everyone wants an Alexa-type personal assistant. Security measures are essential components that must be embedded within every product category an infrastructure provider offers, Dasgupta said. He said that, within the financial services industry, being able to identify access anomalies and fraud detection top the list of priorities from a customer standpoint. This includes not only knowing if someone entered a wrong password but a lot of today’s most effective security infrastructures — including Cisco’s — are dependent on behavior. This means being able to identify whether it is the right user, the right profile, the right application, or the right account, at any given time, he said. AI is crucial to these types of security applications. He said other considerations include determining from which device a person is accessing an account and whether that person is inputting the right credentials. Overall, AI hinges on the ability to see, collect and analyze massive amounts of data, he said. Slamecka added that another priority for institutions should be not only how to implement the right level of security but to do so in a cost-effective manner as well. “The question that’s emerging for a lot of the smaller institutions is how do they take advantage of the kinds of automation and other advances that AI and machine learning can bring to their infrastructure?” Slamecka said. Cisco is positioned to help those types of organizations across the whole range of financial services that may be more challenged to adopt automation as quickly as do larger institutions. But even the largest national banks are still learning how to best implement the latest infrastructure technology, and Cisco is helping them figure it out, Dasgupta said. “Those large institutions actually have so many different uses for AI that they’re not exactly sure which ones to do first,” he said. Financial institutions can be more competitive and improve the customer experience by adopting AI technology. Conversely, he said he has seen smaller, boutique institutions focusing on one or two AI infrastructure applications and doing it really well. “Sometimes I find those guys having a better handle on how exactly to use AI,” he said. On the most technologically progressive end of the spectrum, Dasgupta said some banks are even looking at removing humans from all of their branch locations. AI and machine learning are still in their nascent stages, but they are here to stay and are only going to become more integrated into our daily lives, Dasgupta said, so it is important for financial institutions to adopt them now. And Cisco’s infrastructure solutions can help them employ AI technology in ways that will be most beneficial for the institutions and their customers. Slamecka noted that he believes the element of customer experience will be extremely important in the coming year. And, from a management perspective, he said the institutions will need to make these connections, take advantage of their infrastructures, and implement the right levels of security in a cost-effective manner. 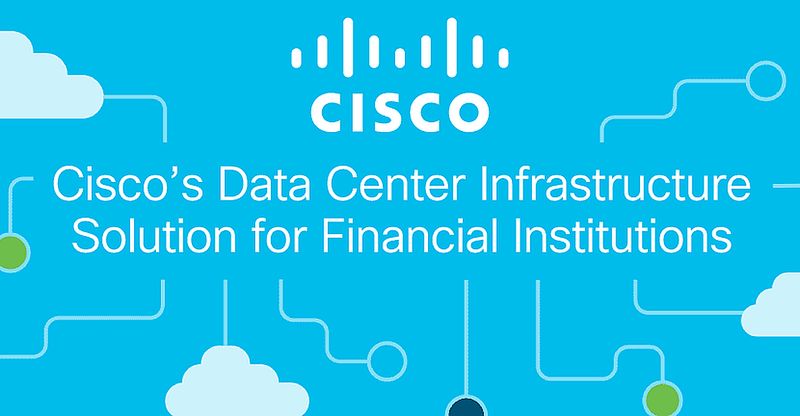 As evidenced by Cisco’s recent case study on how its ACI solution helped Experian, the company’s data center and networking products are able to bolster infrastructure and help financial institutions compete in an increasingly automated industry.